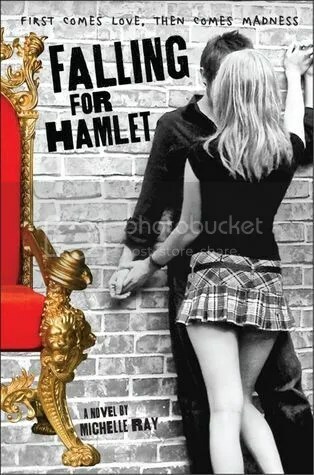 In any case, Falling for Hamlet by Michelle Ray, a modern retelling of Hamlet from Ophelia’s point of view, was completely off my radar, and would have stayed that way if a friend hadn’t recommended it. I sure am glad that she did. Because you guys! I fell for Michelle Ray’s version of the character Hamlet! I fell hard. For about the first third of the book, I was in love with him. Desperately. In. Love. I wanted to kiss him and marry him and run away with him forever and ever. I understood why Ophelia was so wrapped up in him because SO WAS I. I stayed up late reading, fell asleep with the book beside me, and dreamed about Hamlet all night. But there was something about this Hamlet. He was intense. He was silly. He was needy. He was romantic-ish. For some reason, that combination won me over and I was so very into him. The next morning, I dove back into the book immediately when I woke up. That’s when horrible things started happening and Hamlet started to scare me. By the end of the story, after seeing how much Ophelia had lost because of her love for Hamlet and her involvement in his family, I was relieved that it all happened to her and not to me. Your experience reading this sounds kind of perfect considering the story. I’m adding it to my TBR pile! wow, i just noticed how short Ophelia’s skirt is on the cover and i’ve had this book on my shelf for months! Michelle Ray is my Literature and the Humanities teacher!!!! I absolutely love her and this book!